I suppose it all started with the question marks. When John Nathan-Turner took over as producer of "Doctor Who" in 1980, one of his first demands was to upgrade the title character's costume by adding little question marks to the shirt collars. Cute and playful, sure, and certainly nothing weirder than a mammoth scarf or ruffled shirts - but also a bit too obvious in its winky-winky attitude. It's a visual gag that slaps you in the face and asks if you "get it." Then came the celery on the lapel, and again: we get the joke Nathan-Turner was trying to make, and Fifth Doctor Peter Davison somehow managed to make it work, but, you know, still. Yeesh. By the time Davison was replaced with Sixth Doctor Colin Baker, the show became one long parade of good ideas executed very, very badly. Some of the iffy choices are obvious, most notably the Doctor's garish multi-colored "bad taste" costume, liked by Nathan-Turner and no one else. (Baker famously dubbed it "an explosion in a rainbow factory.") Then there's the decision to waste an entire season on a corny metaphor by putting the Doctor on trial (just as the series had to defend itself to the BBC); a season-spanning adventure could've been marvelous, but the whole thing is mostly undone by a problematic structure (not to mention some in-house troubles that left the finale a bizarre mess). And then there is "The Twin Dilemma." This was Baker's first serial in the leading role, and it set the tone of his brief tenure. Unfortunately, that tone was off-pitch right from the start. For starters, Nathan-Turner demanded to bring Baker in not at the start of a new season, but in the last four episodes of Davison's farewell season. 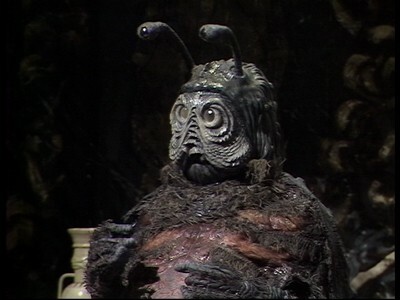 The reasoning was that by offering a lengthy "preview" of the new Doctor, fans wouldn't have to wait nine months to get used to Baker; the producer feared that some fans might not bother returning to the show. Sounds reasonable, but it's a choice brimming with backfire potential: fans could very well decide in March 1984, not January 1985, that they didn't like Baker, spend the rest of the year complaining about him, and not bothering to tune in for the new season. At least by withholding Baker's debut, you could play out the anticipation. The real risk of placing Baker at the end of season twenty-one was linked to a second, equally dicey proposition: make the Sixth Doctor temperamental, dangerous, possibly untrustworthy. This was rooted in a tradition of making a new Doctor a bit unstable in his initial outing, as he's still recovering from the violent changes of regeneration. "Castrovalva," Davison's premiere serial, took this premise to an extreme by building a story around the severe weakening (both physically and mentally) of the Doctor. Since Baker's Doctor was designed to be Davison's opposite in many ways - loud and pompous, compared to the Fifth Doctor's quiet boyishness - it was decided to design Baker's regeneration story around such polar extremes. His brain still rewiring itself, the Sixth Doctor here becomes prone to violent paranoia, to the point where in one scene, he attempts to strangle his companion, Peri (Nicola Bryant). Outbursts surface throughout all four episodes, but the Doctor settles down, somewhat, by the finale. 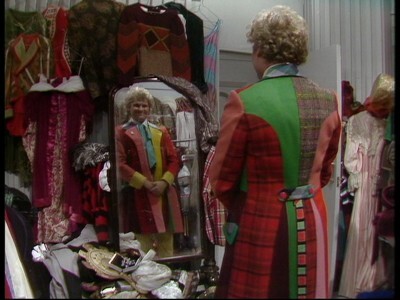 But not too much - Nathan-Turner and Baker had decided to leave a bit of doubt in the viewers' minds, the plan being that the Sixth Doctor would have to earn the audience's trust over the next few years, with the Doctor's kindness revealing itself rather slowly. It's a terrific concept, especially in terms of keeping a twenty-two year old show from becoming stale. But from start to finish, the series never truly plays this notion out. The next year would find Baker settling quite easily into a pattern of flamboyance and too-loud arrogance, while the character's temperamental relationship with Peri became more shouty-shouty than uncertain mystery. A few serials (most notably "Revelation of the Daleks") hinted at a grander character arc, but any attempts to take the long view of character development eventually get abandoned when Nathan-Turner scuttled all plans and replaced them with the "Trial of a Time Lord" season, which offered no room to wrap up the "is the Doctor trustworthy?" thread first spun here. Perhaps the show just didn't have it in itself to go that far in the first place. Anthony Steven's script never fully commits to the Doctor-gone-mad storyline; unlike "Castrovalva," "The Twin Dilemma" continually shoves its regeneration plotline into the corner, as if unsure what exactly to do with the characters once they leave the TARDIS console room and enter the story proper. Worse, the story proper is a half-assed muddle of vague alien threats and vaguer sci-fi concepts. The serial's making-of is infamous among fans: Steven, a veteran television writer who had never handled sci-fi before, was overdue in delivering his scripts, providing increasingly bizarre excuses for his tardiness (the most notorious being a claim that his typewriter exploded). Once delivered, the scripts revealed massive problems, including action that would've been too costly to shoot on a BBC budget and a fourth episode that pretty much abandoned several storylines, leaving them unresolved. Steven eventually fell ill, and script writer Eric Saward was left with little time to rewrite the story. Is all of this obvious while watching the serial? Pretty much. Only the first episode truly grabs our attention, what with the Doctor strangling Peri and such. But even here, the script barely seems to care, putting most of its focus instead on the story of mathematical prodigies Romulus and Remus (Gavin and Andrew Conrad, a last-minute casting choice; kindly put, they're just not good), who are kidnapped by an agent of Mestor (Edwin Richfield), a giant slug-thing who wishes to rearrange the planets in a star system for his own nefarious purposes. It's old school "Who" all the way, except the characters are woefully underwritten, the suspense is virtually nonexistent, and all the action feels like a slight diversion from the main regeneration story. Or maybe it's vice versa. The script can never quite decide which plot thread is more important, so it never fully bothers with either. Aside from the initial set-up, the regeneration story is reduced mainly to afterthoughts of "oh, the Doctor should throw a fit here." The Nestor story, meanwhile, is a jumble of set-ups that go nowhere; the Doctor's attempts at heroics are constantly distracted by his mood swings. The distractions leave both stories weaker. There are only a few times when the serial manages to click. 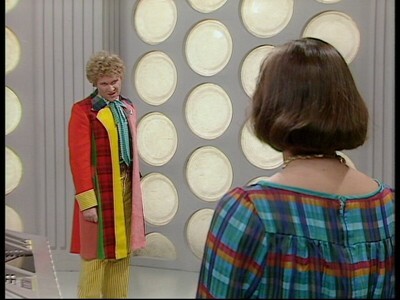 Most of these come early on and involve the Doctor's mania (and Baker's willingness to chew the scenery); there's even a rare bit of emotional connection when the Doctor confuses Peri with former assistant Tegan. Elsewhere, Maurice Denham pops up as an old friend of the Doctor, and there's a world-weariness there that allows for some nice drama. But such moments hardly make up for everything else. With wooden dialogue, goofy effects, and a dim-witted plot that barely manages to stretch itself out to a full serial length, "The Twin Dilemma" is precisely what non-fans have in mind when they imagine the worst of classic "Who." And then, well, Steven's (and Saward's) script wraps it all up all too briskly, deciding that, for continuity's sake, the Doctor's mania can be shooed away, that Peri has decided to instantly adore her newly regenerated Time Lord pal, that everything can be all wrapped up neatly without ever really earning it. The final line of dialogue has become the stuff of legend, especially in retrospect: "I am the Doctor... whether you like it or not." It's the serial's only great line of dialogue, so in tune with the Sixth Doctor's unpleasantness (and a bit of a poke aimed at Saward, who was unhappy with Baker's casting), yet of all the possible ways to bid the fans adieu for nine months, Nathan-Turner chose this? He's practically daring viewers to keep with the series. Seems like a great idea - let's give the fans something to argue about until January - but, like everything else in this troubled era of "Doctor Who," it's an idea executed very, very badly. BBC Video collects all four episodes of "The Twin Dilemma" on a single disc. "Who" fans will know by now what to expect from these releases. Despite the limitations of the source material, the 1.33:1 full frame transfer is quite solid throughout. Color levels and detail are splendid in the studio-bound scenes shot on video; the shot-on-film outdoor scenes turned out quite well, too, with minimal grain and a crispness to the colors. The Dolby mono soundtrack has no problems, with clear dialogue and well-mixed music. Optional English subtitles are included. Baker, Bryant, and actor Kevin McNally team up for another excellent commentary track. Previous "Who" commentaries have been a delight, and this one's no exception - thanks in part to Baker's gift of gab and some fairly blunt honesty. Also accompanying the episodes is a set of optional production note subtitles, providing the usual heavy amount of behind-the-scenes trivia. "Look 100 Years Younger" (11:46; 1.78:1 anamorphic) finds Baker and comedian/"style icon" Amy Lamé making catty comments as they watch all those scenes where the new Doctors try on their new outfits. It's a winking dig at one of the series' goofiest clichés mixed with a chance to truly dissect the evolution of "Who" costuming, from the understated early years, through the tacky 80s, and on to today's geek chic. The multi-part documentary on "Who" comics (spread out over various discs) finally tackles the Baker years with "Stripped for Action: The Sixth Doctor" (17:46; 1.78:1). A good number of the comics' writers and artists pop by for interviews as the featurette runs down the mid-80s history of the strip. Vintage excerpts from "Breakfast Time" (9:54; 1.33:1) and "Blue Peter" (10:02; 1.33:1) feature Baker and Bryant on the promotional circuit, hyping the upcoming "Twin Dilemma" premiere. Poor Baker, having to repeatedly defend that costume. It's obvious he already hates it. A batch of BBC continuity announcements (3:13 total; 1.33:1) and a slideshow of production photos (8:05; 1.33:1) are the finishing touches for all your "Twin Dilemma" needs. A preview for the new-series season four box set and a promo for BBC America play as the disc loads. Finally, PDF files of the original "Radio Times" listings are accessible via your computer's DVD-Rom drive. It's definitely nice to finally have the complete Baker run available on disc, and it's even nicer to have see such an unloved serial be given the same attention as other "Who" stories in terms of restoration and bonus material. But while the presentation is enough to make "The Twin Dilemma" Recommended for "Who" completists, the story itself is such a mess that the average fan should just Rent It out of curiosity.